Hutchinson coach Ryan Cornelsen isn’t going to lie. He would have had serious doubts if someone had told him early in the season that his Salthawks would be playing for a state championship. But, sure enough, here they are. 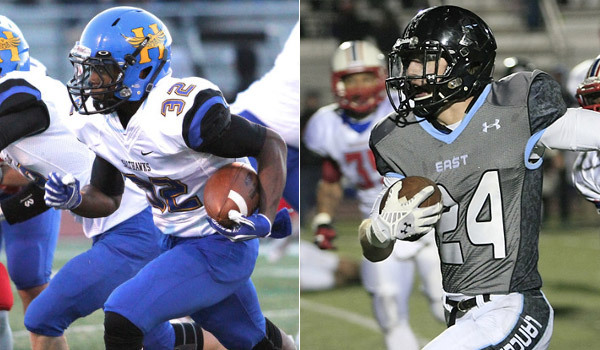 Hutchinson (8-4) is set to meet Shawnee Mission East (12-0) in the Class 6A state championship at 1 p.m. Saturday at Emporia State University’s Welch Stadium. The Salthawks were riddled with injuries and opened the season with a 2-4 record. “I would have liked to believe you, but I probably wouldn’t have,” Cornelsen said. “It was probably the most frustrated I’ve been in my career. Not only were the injuries frustrating, but you’re losing as well. It was a hard time. Cornelsen is in his first year as Hutchinson’s head coach after leading Hays High School for several years. Hutchinson senior running back Blaik Middleton has rushed for more than 2,600 yards and 36 touchdowns. He ran for 356 yards and six touchdowns last week against Lawrence Free State. Quarterback Turner Wintz has rushed for more than 800 yards and has passed for more than 500. Lucas Dunbar leads the defense with 94 tackles. Hutchinson enters on a six-game winning streak. Delaney is familiar with the Hutchinson tradition. He was an assistant with the Salthawks from 2006-09, before leaving to become head coach at Emporia High School. The Lancers finished as the state runner-up to Derby last year. Wyatt Edmisten leads Shawnee Mission East’s flexbone offense with 1,370 yards and 29 touchdowns. Gunnar Englund, Jackson Gossick, Calvin Jones and Sam Huffman have all rushed for more than 450 yards. Kyle Ball is the defensive leader with 112 tackles and 10 sacks. “They play extremely hard,” Cornelsen said. “They don’t have any weaknesses. Every player is a special ballplayer. They have three or four different guys who can hurt you with the run. The battle up front is likely the key in a game between two run-first teams.